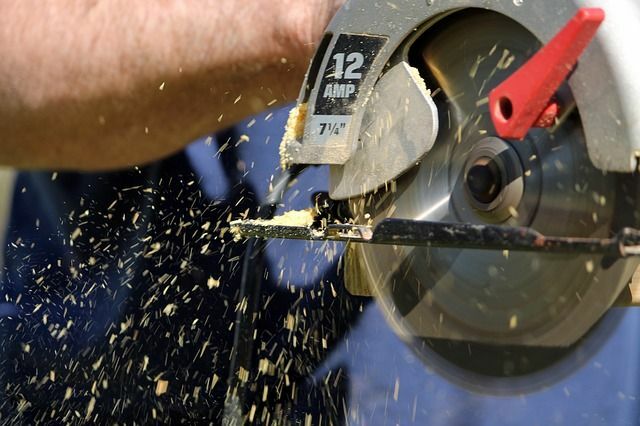 1 Are you looking for tips and tricks using a circular saw? 2 What is a circular saw? 4 How to use a circular saw for beginners? Are you looking for tips and tricks using a circular saw? Circular saw is a most needed power tool for woodworking. It is an electrical power saw which works rotary motion around an axis. This saw is able to cut many types of materials like metal, wood, and plastic but it depends on blade types. From the invention time of 18th century, it was used for woodworking. At the present time it is used for cutting different materials but most of the uses for wood cutting and now we will know uses of it. You can get circular saw guide system here. So let’s start with me. There are many types of circular saw like an abrasive saw, biscuit saw, brush cutter, concrete saw, Worx circular saw etc. How to use a circular saw for beginners? At the starting level, you must have to gain a clear idea. I will discuss the full process from start to the end step by step or saw tricks and techniques. You just follow the instruction you can realize its so much simpler. Blade setting: The first step will be setting blade in the saw perfectly. Because of without proper setting you may face many hazardous situations. The blade can be able to overcome ¼ or ½ inch depth wood. You have to choose a blade according to your wood. Perfect saw selection: There are several saws you may find in the marketplace for several types of work. But you have to understand what saw will be perfect for you. Generally, we are using the crosscutting, rip cutting blade for woodwork. Besides, this saw is used for another work. Normally 10-inch blade is used for them. There is also mini circular saw which is tough to use but you always try to select the standard saw. I think you just want to get a wonderful and perfect result from your circular saw crosscut. That’s why you have to measure your wood and marking it by pencil then you can use a meter tape for the more specific mark. After completing the measurement you have to look at the surface of the cutting table. Try to check it again and again. Consider the depth and bevel angle is right or not. Lake of a right cutting table your total effort may be losing. So be careful about it. Circular saw level cut capacity is generally 45 degrees. This saw has wonderful bevel feature of 22-1/2 and 45 degrees’ sizes. It’s normal bevel setting of circular setting. So you have to set up 22-1/ 2 and 45 degrees rotated. It will be the perfect matching. There has a LED light which can help you to see the marking selected area perfectly. But if you are so much young you may be you don’t need to use this light of circular saw. This light is really helpful for illuminated the right area. We can easily follow the cutting line. It’s not so much important fact of using laser light but as a beginner, you can get help from laser light. Laser light can make your cutting process easier. So if you want to use laser light, check the light properly. Perfect open space is most important considering fact. Because you are not only using a saw but also cutting valuable wood. Before cutting you have to keep enough space for reaching the end of the cut. All recommendation checks again. Be ready for starting. Set the circular saw on the fixed marking wood base. You must try to keep it straight as much as possible. Plug your circular saw with electric connection. Then apply your needed energy and started to run it. The hand pressure can’t be too much or too low. Because of both of harmful for this work or you may face problem in your circular saw. If you apply overpressure, then you’re the motor may be burst or the blade can be interrupted. It is really a potential tool. But you have to follow some instruction at the time of using it. Otherwise, you may get some harmful effects. You have to use a glass for circular saw safety. Carefully maintain the blade uses. You also should have remove jewelry for your safety. Q: Can you cut plywood with a circular saw? -Yes, I can cut plywood with a circular saw. If the blade teeth are not well then I can’t cut wood cleanly. But circular saw works upstroke which is easy for play wood cutting. Q: Can you use a circular saw to cut laminate flooring? -Yes, I can use a circular saw to cut laminate flooring. I have to use a finishing blade for a clear-cut. Generally, I can use duct tape and finished side up for cutting. So what are you feeling about circular saw uses? But here is some issues must be considered for projects such as how to sharpen a circular table saw? how to charge a circular table saw? how to use a circular saw without a table? I hope you may understand the whole process is very easy. Just make your plan and start your woodwork with a circular saw. It is the most wonderful hand power tools for your home improvement. Just keep it the mind of your circular saw safety first.